Hello friends and happy WEEKEND! I’m off at an Illustrated Faith class all day but will be checking in on my phone if I can. Well, you know how likely that is, right? lol. Anyway….some updated info! Do I have to be there at a special time? No. It’s not broadcast live – you can watch anytime. Will I have ongoing access? Yep! As long as this website is here, the class will be here for you. Save those emails with the link and password and you’ll be good to go. Can I download the videos? I’m going to try that after all. I had a really bad experience last year with someone swiping copies of my videos and posing as me on a new channel, and I’m extremely nervous about that. But if y’all pinky swear not to do that….then I’ll make the videos downloadable. Can I get a list of markers so I know how bad the budget will be hit before I sign up? You can go to THIS page, it’s mostly the list that I’ll be using throughout class. But – in preclass I provide a list of alternate colors for MANY of them, so you may have plenty of those colors. If you get into preclass and realize there’s just no way you can make it work, email me and I can refund your money. No harm no foul! How about other supplies, like stamps? For the stamped cards I’ll be showing, you do NOT have to have those stamps. You may well have something in your stash that’ll work. In preclass you can see sneak peeks, and I’ve added a little description of other images that can work to practice the same skill on that card. 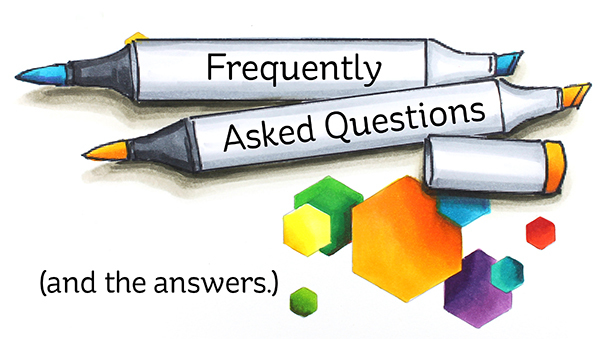 Can I use other alcohol markers? Honestly I don’t know. I have two people who are going to try it with SN markers and see if the techniques work, but many of these ideas are color- and nib-dependent, so I can’t make promises. If you’d like to wait for my “guinea pigs” to go through the first round, I’ll get a report back from them and let you know what they say, ok? Some of you stayed tuned to yesterday’s blog post long enough to check out the new blending groups graphic – others missed it in the excitement to start class! lol. So be sure to go add it to your pinboard. Click HERE or on the image to go see! I’m wondering if we shouldn’t start thinking about sharing markers? If we share our general area, we can get groups to meet at local craft stores, or other shared spaces that won’t mind video being played or craft supplies being brought in (provided we all make some kind of token purchase as a thank you). I have most of the markers or alternates. I think there are 5 that I did not have or have an alternate for. Most were already on my want list. I also have a lot of prismacolor which blend well with Copics, but are not quite as smooth (and are disposable ugh). I’m on the east side of Raleigh, N.C. if anyone wants to team up. I’ve signed up and my payment is complete. Where do I access the pre-class materials? Adding that mainly, at this time, I want to see the list of alternate colors. I’m 19 short but if I have alternates I can whittle down my list a little. You should have gotten the emal by now, did you check spam? Sandy, please share with us the difference between this class and the Online Cards Class for Copics that mostly you taught. I know that you addressed this on your periscope, but would you address this where those who are considering the class will have access to it for more than 24 hours? You’ll have ongoing access – you can re-watch any time as many times as you like. The Periscope is the thing only available for 24 hours – no class content has a time limit. I’ll look into it as soon as I’m back at a computer. I’ve checked and it was sent to you, can you please check your spam folder? Oh hooray! Glad it’s there. I also need the link to the class markers list. The link isn’t functioning. Thanks! It’s the same link as the chart below, sorry—link is fixed now. I would like to compare the markers I own with the ones that will be used in the class, but the list of class markers doesn’t seem to have a clickable link. Could you give me a link? Thanks. I just don’t understand how people can give negative and mean comments. If you don’t want to take the class then just get out of the site and move on. You are an amazingly talented artist and are so generous to share those talented with us. Thanks for this information. Sorry about the negative comments you get time to time. Good morning! Thanks for compiling the questions in one location. 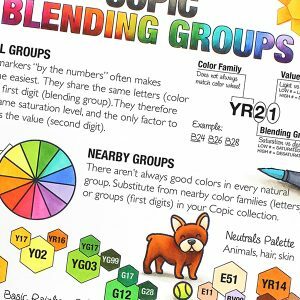 Is the blending groups graphic going to be part of the class (pre-colored or blank)? I can already tell I’d like to have one to go with my hex chart and my standard Copic chart (which I made myself). Hmm I hadn’t considered that but it’s a great idea!